When I think about blogging I think, hey, since people are reading my blog the least I could do is go out and read other people's blogs and give them 5 stars. Whenever I try to do that II don't really find that entertaining or fun. Who finds reading about other people's thoughts entertaining and about how their day went? That's boring. Oh well, at least you're reading my blog. Maybe it's because you've had a slow day or something. I've been trying to share my awesome playlist but you know what I've come to realize that people don't like my music as much as I don't like theirs which is ...expected. Recently I've been laddering offracing. That's kind of fun. Summer vacation is coming to a close which kind of makes me sad. Robin Williams died and that hasn't quite sunk in yet. Other than that though everything's been going perfectly fine. When you decide to offrace and climb the ladder it feels like a really fresh start and you get to do all the things that you get stressed about playing against with your main race against other players. I've been playing Terran recently and holy hell there are a lot of protoss players on iccup. I've literally played 60+ games today and yesterday and 50+ have been against protoss which is my weakest matchup in comparison to my tvz. My TvT is just as bad as my TvP. I see what Boxer does and I think I can do the same thing but in reality it's actually way tougher when you're actually trying to do it. Protoss do the dumbest stuff. They just do proxy gateways in my main base, they do the pylon block to prevent a full wall in, they gas steal all the time, and sometimes they gas steal, pylon wall in block, and proxy gate rush you all at the same time. It's infuriating. Then there's that moment when the protoss is harassing that scv that's building the barracks. I just fall apart when that happens. My scout doesn't go off in time, I lose an SCV, my factory, everything is delayed. I do a better job at preventing worker harass when I'm playing my main race Zerg. Plus, terran mech just feels so clunky. I tried innovating by going a medic marine siege tank style since that fit myself better. I thought about it after reading one of Day9's podcast transcripts about something. Build orders? I forget but the one thing that caught my eye was when he decided he was sick of going mutaling in zvz and he decided to go just Hydras. He went 56-1 vs. Zerg in that PGTour season refining the hydra style and I was just impressed. At the end of the day I compared and contrasted mech and bio and really mech is so much better in so many ways but I'm just so bad at it. Sometimes I'd get into the groove after seeing Sea's FPVODS and just trounce any cheesy protoss player and deflect any aggression flawlessly. That's the power of Sea's waters flowing into my veins. I got mad and decided to go Protoss myself and did the most dumbest 1 gateway forge cannon rush strategy vs. some terran....and it worked. Except the game stretched on for 30+ minutes even though I had the overwhelming advantage because of some clumsy mistakes but I eventually won with constant harass on all fronts. That was fun. I played some 30+ minute PvZ even though I got a really good lead so. Yah. The rest I ended up losing. I also had some ideas on making a battle report since I always see people posting battle reports of themselves winning and of course how could you expect them to do otherwise. If I were to do a battle report it'd be of me losing but it'd have an amazing twist. It'd start off with me playing my main race vs. some random guy. Then when the the battle report came to a close I'd be typing "Wait,wasn't I supposed to lose this battle report"? Oh, that's right. I was actually offracing and the person you thought was me was actually a completely random guy! Good twist. I remember this one site that hosted tons of sc battle reports back when replays weren't a thing. There I read the awesome 1998 beta tournament between Zileas and Agent911. Pretty cool. I read some of these battle reports, an amazing post from psyonic reaver about his incredibly amazing life with StarCraft, and I learned more about the history of battle reports about how even when replays were openly available battle reports continued as this sort of art in literary genius and truly the BR community had some amazing people who would put so much effort into just a single battle report doing creative things. I forget the name of this one guy but he would go out of his way to make the best battle reports using...I forget what. But he'd do it. I was watching some Nal_ra Oldboy today which is this reality korean tv show featuring everyone's favorite Dreamer Toss Nal_ra trying to make it back into progaming after a 4 year long hiatus. Despite months of practice he didn't qualify for a starleague and shortly after he went into the military. I heard he's gotten out now and is a caster for League of Legions. hum this looks like a long blog post but it felt so short to write. Blogs like this are made possible by viewers like you. Thank you. 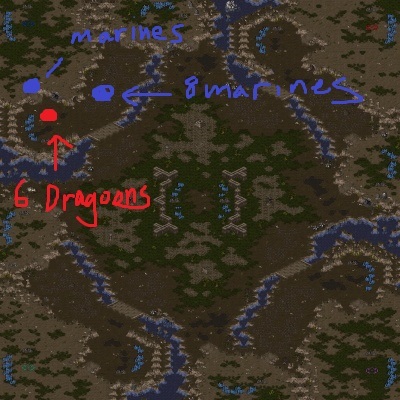 Why am I not a zergling yet? 5/5 to anyone playing SC, BW or SC2. you know what just drop the sc related blogs and devote yourself to ms paint pictures. Paint something exotic, like maybe a sandy beach! 5 stars, I'm going to write a blog about how I read Ty2's blog today.